Asia’s economic development is the biggest success story in recent history and has a strong capacity for further growth. Continued political and economic cooperation in Asia can play a key role in enabling regional and global prosperity for the future. Japan’s post-WWII revival as an advanced high-income economy was swiftly followed by the emergence of the ‘Four Asian Tigers’: South Korea, Taiwan, Hong Kong and Singapore. More recently, the steady rise of China has revolutionised the global economy. The Asian financial crisis in the late 1990s led to substantial financial reforms; as a result, the region’s economies remained relatively stable during the global recession and Asia is now set to be the world’s fastest-growing consumer market. The Asian Development Bank further predicts that if the region’s successful economies can sustain their growth, Asia could contribute 50 per cent of the world’s GDP by 2050. This would reduce poverty throughout the region and give 3 billion Asians income levels equal to those of Europe today. To maintain this momentum, Asia’s economies are continuing to implement structural reforms and plan for sustainable growth. Home to 60 per cent of the world’s population, the continent currently only contributes 27 per cent of the world’s GDP – and Asia’s economies and political systems are at vastly different levels. Accordingly, achieving socio-economic inclusion through channels such as infrastructure development, education and entrepreneurship is a priority for countries throughout Asia. The continent’s emerging economies are also actively working to avoid the ‘middle income trap’ where per-capita income levels stall after reaching a certain level. Following the framework provided by regional associations such as the Association of Southeast Asian Nations (ASEAN), Asia’s economies are continuing to integrate and reduce barriers to international commerce. Such measures will enable greater stability, security and prosperity for Asia as well as the rest of the world. Ireland is actively driving trade with Asia: since 2002, the number of Irish companies with offices in Asia has grown from 100 to 360 and diplomatic and trade missions are underway to further promote bilateral economic relations. DHL pioneered express services in Asia in the early 1970s and in 1980 became the first international express company to enter China. Today, DHL has a vast network in Asia with four key hubs: Hong Kong, Bangkok, Singapore and the DHL North Asia Hub in Shanghai. The Shanghai location, which opened in 2012, is the biggest express hub in Asia. The facility incorporates sustainability solutions such as energy-efficient lighting and a solar-powered system to provide hot water. 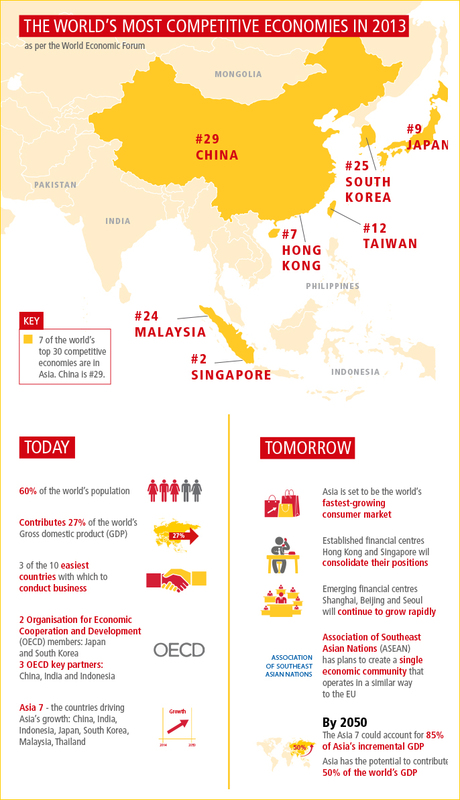 DHL supports international businesses and Asia’s own fast-growing enterprises by continuously improving trade flows both within the continent and to the rest of the world. This includes links to emerging markets in the Middle East, Africa and Latin America. DHL offers time-definite morning delivery to major cities in North Asia and next-day delivery from Japan to the USA. Further routes are planned to directly connect Shanghai to DHL Express hubs and gateways in Europe.